Mention Navarre Beach Florida and I have a flashback to being here as a young child and witnessing the biggest sunrises and sunsets I had ever seen. 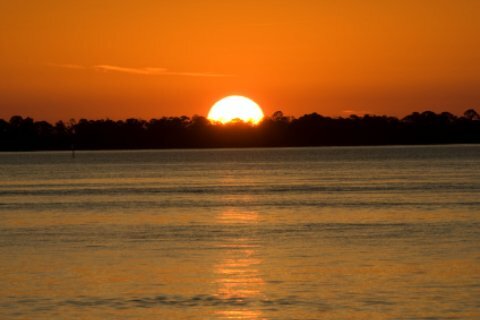 The sun was enormous; magnified by the Gulf of Mexico and I was mesmerized. The northwest, aka panhandle region, runs east-west so you are treated to sunrises and sunsets here. Most Florida beaches run north-south so you get a gorgeous sunrise OR a gorgeous sunset but not both. Here on the Panhandle, you get a double-dip! Bring someone special and hold hands or better yet, hold a glass of bubbly and toast the sun's arrival and departure. The sun shines over 340 days a year on this beautiful subtropic beach enticing you to return again and again! The weather is warm on Navarre Beach Florida all year here. While the temperature rarely drops below 50 degrees, even in the evenings, you can visit and expect a warm, sunshiny day nearly any time of year. Summer months are high season here on the panhandle and are especially grand! Navarre Beach remains fairly undeveloped and most activities consist of water sports and activities such as swimming, jet skiing, surfing, snorkeling and scuba diving. Santa Rosa Island (the barrier island that Navarre Beach is located on) offers many great relaxing activities. Spoil yourself for a day of total relaxation at the Wabi Sabi Day Spa. Visit one of the three championship golf courses located nearby, such as Tiger Point, which offers a challenging and scenic course. Once a year (usually in September) tourists and locals can enjoy the Round Island Race. It’s quite exciting (and a one of a kind experience) to witness sailboats racing around the Santa Rosa Sound. Kids of most ages: Build a sand castle out of the perfect white sand or see who can collect the most beautiful or unique seashells along the beach or enjoy a Nature Walk along the Santa Rosa Sound. Eating: There are many great seafood places to choose from, such as the homey Hal’s Seafood and there are also inexpensive steakhouses that serve better than average choices such as the East River Smokehouse Grill. Sleeping: There are a few moderately priced choices in the area such as Best Western Navarre or Hampton Inn & Suites Navarre. This beautiful beach remains mostly untouched, so there aren’t many hotels, but any one that you choose is sure to offer a great view of the beach. Put Navarre Beach on your calendar and come see for yourself how the landscape looks when the turquoise water meets sugary white, soft sand and you will agree it is aptly called the Emerald Coast.